# comebackAtem Kaiba's technology can always get him what he wants, without any outside help, but in this case, it's only almost. This is available as a print here! One of the things that struck me about the movie was how dedicated Kaiba is... I literally sat there like oAo for half the movie. How far is he willing to go to get what he wants? Apparently to infinity and beyond. My original concept for this picture was far more abstract in composition, and although it was interesting, it didn't have a lot of impact. I didn't feel anything. So many hours later, and battling the ever-challenging torso foreshortening (dang it, I'll conquer you one day), it became this! I'm trying so hard to improve with lighting and shadows...and shiny things Q v Q / Please enjoy! This is beautiful! 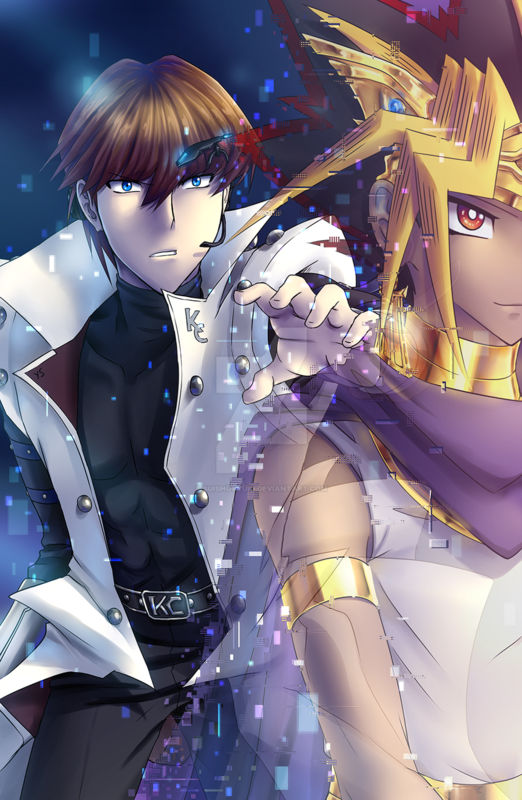 I think one of my favorite aspects of this picture is the way Atem's gaze is just fixed straight ahead. He's not looking back at all at the same time Kaiba is completely stuck and can't move forward. It breaks my heart. </3 The lighting turned out beautifully, and I love the glitch effects! I simply adore EVERYTHING HERE! not only because it's my most favorite theme but because of the amazing concept, art and feeling this gives! Ahh thank you so much! ;v; I'm glad it conveys that well, and I'm happy you like it! Oh! You're welcome ;v; It was a challenging but rewarding process! I enjoyed it. Sure, I can upload it to Tumblr! This captures such a wonderful mood. I love that you added the glitch effect as if he is disappearing and not really there. The expression on his face is wonderful. This drawing has lots of wonderful details. I loved the Darkside of Dimensions movie. You are so lucky that you will get to see Dan and Eric. I hope you enjoy meeting them. I really want to meet them some day. Nice work. It was a good movie ^^ I am excited to get to see them again! The last time was at MTAC in 2014, but I wasn't able to get Dan's autograph because the line was forever long ;v; I got Eric's though, so I'll try for Dan's again this time. I hope you get to meet them sometime too!! You're welcome and it was indeed. I saw the English version twice and the Japanese version once. Lucky...I haven't met either of them. Good luck with getting Dan's autograph. He is quite a popular person. I am sure I will. I just hope it will be soon. Awesome and glad to hear that. One of the reasons I really want to meet them is, because of how nice they are to their fans. I know I will be able to meet them some day. ohhh, very beautoiful *__* I love your recent pictures of Kaiba and this here. Nice, really <3 especially the coloration is amazing. Nice job sweetie!! I can't WAIT to see you!! You know I'll definitely be getting a commission from you Will you be there all weekend? Seto: No! You can't go! Not after coming this far! Let me duel you! Let me show you how strong I've gotten! Atem!